It’s so wonderful to have friends who teach you about some great moments in history that could have been pivotal for the world we live today. A few days ago, I was visiting with Dan Schechter in Los Angeles – principal of L.E.K. 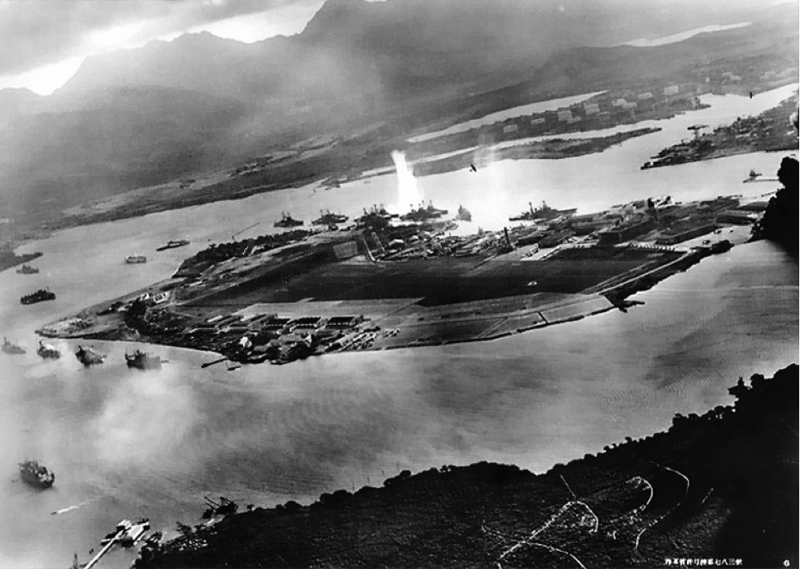 Consulting, a prominent global consulting – who showed me the following picture of the infamous attack on Pearl Harbor. Dan pointed out the Japanese planes and the oil tanks in the background. The Japanese were basing their strategy on the element of surprise and were able to inflict significant damage on the American battleships, but neglected to attack the carriers, thinking that the number of battleships would decide the war. However, as Dan pointed out, they failed to destroy the oil tanks and the repair yards, i.e. the basic elements of operations. If the oil tanks had been destroyed then the American fleet most probably would not be able to fight the battles of Pacific and the decisive battle of Midway, simply because the fuel for the operations would not be there. It was a disastrous strategic mistake and miscalculation. Similarly, we would say that it is a strategic mistake for portfolios nowadays to lack the strategic elements of anchoring, hedging, and operational fuel that is needed to empower their holdings. As our commentaries following 2008 pointed out, the crisis was caused by the over-extension of credit based on collateralization and securitization of toxic and questionable assets. The repyhothecation of “assets” via the securitization and derivatives machinery created trillions of dollars in credit facilities that undermined the global financial system. Since then we have treated the symptoms but not the main cause and now live in an era of lower growth prospects. This only makes us cautious as to when the next crisis will erupt that could be the mother of all crises. Pertinent to this subject is this year’s market volatility, which we witnessed again last week. The market started off the week on a positive note expecting the Fed’s move on raising interest rates. The Fed’s decision was greeted with significant equities gains however that upturn lost steam and the markets ended the week lower, losing on average about 0.5%. What’s the cause then of this volatility? As we pointed out in the last commentary, the significant drop in energy prices is making the markets nervous for two reasons: First, there is concern about the health of the high yield market and the banks’ exposure to the energy sector. Second, the global growth engine may slow down if prices reflect slowing demand. 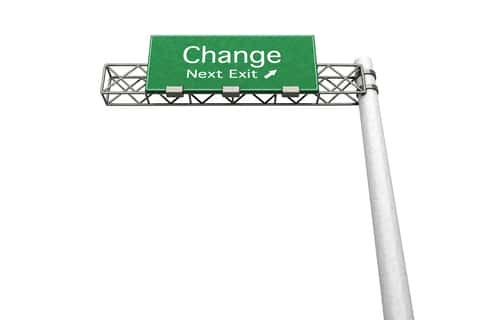 The tactical moves that the title refers to have to do with lower energy prices (which boost consumer spending) along with the technological and demographic changes, all of which are part of the reasons for our cautiously optimistic approach to market developments in 2016. Allow me at this stage to mention two areas which we project to perform well in 2016. These are household-related spending and “experience-related” (traveling, hospitality, entertainment, beautification, etc.) discretionary spending. 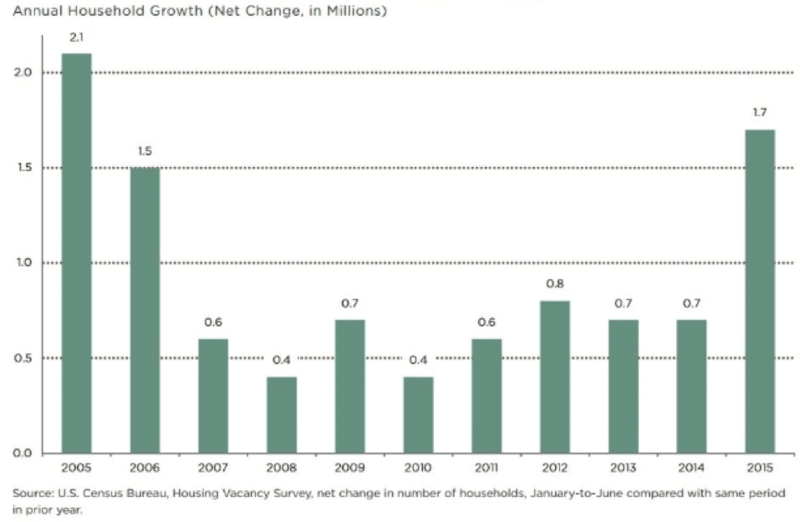 As the graph below shows household formation in the US is on significant rise having surpassed in the first nine months of the year the figures of 2013 and 2014 combined! Based on the graph above we would say that industries and companies related to household formation in the US seem to be promising for the foreseeable future. Tactical moves by investing in those sectors may prove to be a wise choice. Returning now to the main theme of this commentary I would say that some traditional military strategies (annihilation as elaborated by Clausewitz, exhaustion as developed by Delbruck, maneuvering through confusion and disorientation tactics as developed by Liddell Hart, etc.) should be studied as portfolio restructuring takes place in 2016 in order to prepare for the possibility of another major crisis. In that sense we consider it to be a strategic mistake if portfolios are left blowing in the wind of the market rather than planting center of gravity (COGs) seeds that can anchor the portfolio in real hard assets while hedging it in order to derive streams of income that would mitigate risks and allow the returns to be enhanced. The operational side of warfare calls for forces to be directed against the opponent’s center of gravity (COG). This in turn implies that by using shock and disorder the enemy suffers dislocation that leads to paralysis (and hence no need to keep blasting the enemy’s physical units). My fear is that investors exhibit symptoms of disorientation and confusion prior to the eruption of a crisis simply because they failed to be tied to the mast (like Odysseus ordered his sailors to do to him while tempted by the sirens’ wonderful music inviting them to a shipwreck ). Portfolios need to be tied to a mast (i.e. anchored and hedged) as the vessel is approaching the Sirenum Scopuli islands, while pondering existential questions. These days in the western world we celebrate Bethlehem’s message of more than 2,000 years ago. There is no doubt that the manger’s message threw everything off balance. A stunning reversal started in that humble town telling us that it’s not about elaborate palaces of heroes but rather about “weak” victims grounded on a firm message that challenges the conventional status quo. In that sense the victim becomes the hero that inaugurates a new era.